These are Jamaican faves, (salted codfish fritters). These spicy and flavorful fritters can be had as snack, horderves, breakfast, or as a great side dish for brunch. They are staples in a Jamaican kitchen. Over the years, I have indulged in this dish repeatedly. I seem to get the urge for this salty and crispy delight on a week-end when it rains or a little cool on the outskirts. Over the years, I’ve attempted to make the dish somewhat figure friendly. Thus, I’ve included less all-purpose flour in the batter and incorporated mainly whole-wheat flour. This time it’s no different. Moreover, I’ve made a tweak with the dish by doing a platter shape instead of the individual fritters. Maybe, pizza was on my mind. Extract excess sodium from codfish by rinsing with cold tap water. Then boil for approximately five minutes. And repeat the process. Do a taste test to determine the amount of sodium left. When cooled, flake fish and set aside. In a hot skillet with a drizzle of oil, add finely chopped onion, scallion, bell pepper and soften for a few minutes. Make sure to season with a pinch of salt and pepper. Add flaked codfish and scotch bonnet pepper. Set aside. In a bowl, add flour (2) types, a pinch of salt and pepper. 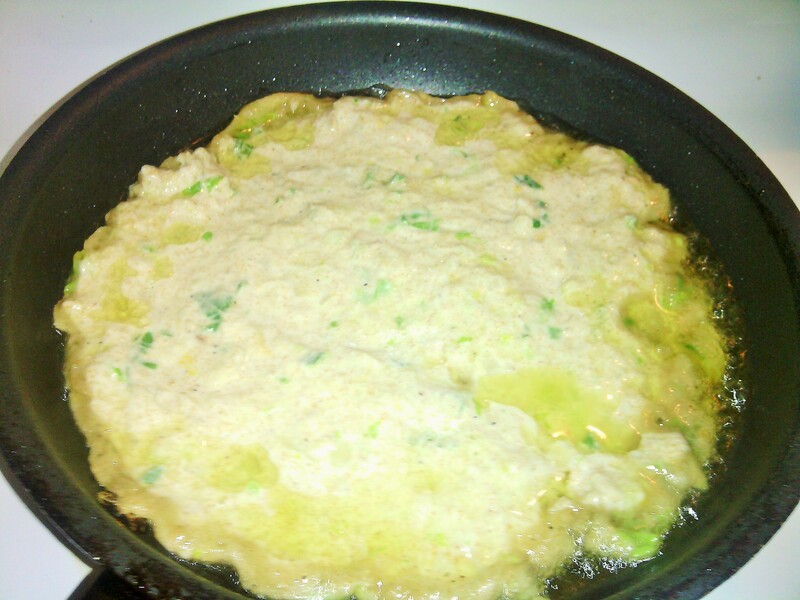 Add water and make a thick batter. Add flaked codfish and sautéed veggies and fold in batter. In a skillet, add oil and flavor with a clove of garlic. Remove to prevent burning. Do a taste test of one fritter. Cook on low to medium heat. If satisfied, add the entire batter to skillet and allow it to cook thoroughly inside and out for approximately 6 to eight minutes. Flip codfish to the other side. It should be crispy on the outside and well cooked internally. Drain excess oil on paper towel and serve hot. Guys, I served my codfish platter with left-over steamed cabbage after I sliced them in rectangle shapes. The dish was just as I anticipated, flaky on the outside and well cooked on the inside. It was packed with amazing flavors and spices. The tad of spice was just right for my taste buds.